Martha Argerich is an elemental force. Like Storm, the girl from the "X-Men" series who can incite all kinds of meteorological tempests, Argerich seems to create around her pianistic blizzards and tornadoes, riding the high waves and casting lightning bolts. What other form can suit such a character better than the good old piano concerto, where competitiveness and excitement are necessary ingredients? 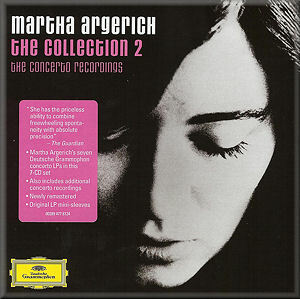 The second volume of the Martha Argerich Collection claims to bring together for the first time all of her concerto recordings for Deutsche Grammophon. This inevitably leads to some repetitions, but don't regret them. There are two versions of the Beethoven Second, each good and each different. Two Ravels, both very good and very different. Two of the Tchaikovsky First, both absolute knockouts. The first disc contains the well-paired twin concertos of Prokofiev and Ravel. I can't think of a better way to do the Prokofiev Third. Argerich combines the bravura and the lyricism, the masculine and the feminine, the beauty and the beast in exactly the right proportion. We get the Ultimate Concerto, all-sided, all-faceted, all-embracing. Claudio Abbado emerges as the most compassionate conductor, completely sharing her mood. The piano and the orchestra seem to be ruled by one mind, and the result is vigorous and athletic. The Berlin Philharmonic proves the most sensitive and refined of instruments. The piano is well recorded, the orchestra is a bit distant, but the total excitement is unbeatable. From the same happy collaboration comes the first recording of the Ravel concerto. A similar electromagnetic field haloes the music. All the sharp edges, all the lazy gestures, all that jazz is just fascinating. Michelangeli on EMI may bathe the music in a more beautiful light, but Argerich's Ravel has the highest voltage possible. And the second movement is mesmerizing. That's where it pays off to have a great orchestra: every little woodwind line is heartfelt, every long note is a gift, every intonation is perfect. Again, the orchestra is recorded somewhat distantly. Seventeen years later, Argerich and Abbado returned to Ravel with the London Symphony. The recording now has more volume and depth, although it also has a certain hollowness in places. Still, this is a great performance, more relaxed than the Berlin, more mature, less exuberant but with a great feeling of freedom. Actually, the second disc does not open with Ravel but with the Chopin Op.11, recorded in 1968. The long orchestral introduction is uncommonly wide-flowing, as if it were a rediscovered part of Schubert's Unfinished. This breadth lingers for the rest of the movement, shedding light on precious details that might otherwise be too fleeting to register. Such ballad-like presentation does not prevent the music having momentum. Towards the end of the development section the floods break free, and the turbulent stream is powerful and ecstatic. The slow movement is a delicate love poem. Finally, in the Rondo all inhibitions are thrown to the winds: it is a fiery lava flow. But wait: this generous disc holds yet another concerto: Liszt's First! Its performance has the same traits as the Chopin: magniloquent gestures and broad panoramas mix with torrents of energy. The tempo in the first part constantly changes. The synergy between soloist and conductor is amazing: the orchestra seems to be fit around pianist like a glove. The recording quality of both the Chopin and the Liszt is very satisfactory. Collaborations of Argerich with Charles Dutoit also tend to be very successful. The 1970 Tchaikovsky First (with the Royal Philharmonic) can restore your love for this overplayed warhorse. The grand length of the first movement goes unnoticed, as each piano note is approached thoughtfully and poetically. There is no hurry, everything is sung, things grow into each other naturally. Power, not blind force, steers the music. The recording quality is excellent. Now comes - Mendelssohn's what? Yes, his Double Concerto. It was written when he was 14, at the time of the last String Symphonies. And so it starts like one. Then it turns, more or less, into a violin sonata of Kreutzer proportions, with piano accompaniment and, here and there, comments from the orchestra. As a pure violin sonata, it would be a marvel. As it is, it is an odd mix, but still very enjoyable. The first movement is a sliced pie, where dead-serious segments (clearly inspired by the Kreutzer) intermix with more cheerful, Paganini-like episodes. The piano has more to say in the ensuing Adagio - kind of Beethoven Violin Romance Meets Mozart Piano Concerto Slow Movement. The third part is a wonderful rondo from Mendelssohn's lightweight category. It seems that Argerich is tired of sitting in the violin's shadow, so she grabs the Rondo and sets it on fire. And Kremer does not hold back but plunges into the dazzling competition. Maybe you won't remember everything from this rather long concerto after it's over, but you will surely enjoy every minute of it, and the aftertaste is superb. Disc number four has Schumann and Chopin's F minor, with Rostropovich and his National Symphony. We start with a lower level than on the first three discs. The great first movement of Schumann is spongy, and synchronization between the orchestra and the soloist is not perfect. The clarinet is apathetic, and the overall concentration is not as in the best recordings. The second movement is quite lethargic, but the third one is excellent. Chopin's Second Concerto is done much better. Again, the orchestra seems sometimes detached from the soloist, but Argerich's piano sings as never before. Here it falls to the pianist to provide the expression; the orchestra mostly does hushed support or thunderous tutti. And you can trust Argerich to ensure that the result is expressive. The concerto, usually overshadowed by its E minor brother, comes alive - poetic and powerful. The second movement is exceptionally inspired, with some really breathtaking moments. The finale is light and bouncy, with quicksilver fingerwork of amazing precision. This is a performance to cherish. Giuseppe Sinopoli has it his way with the two early Beethovens on disc 5. The orchestra is big, very big, and the two concertos emerge as monumentally symphonic as the Violin Concerto. This, in my opinion, does not serve them well. Argerich, like a harnessed steed, rushes forward whenever she sees the opportunity, but Sinopoli softly yet surely pulls her back in line. This is especially noticeable in the First Concerto finale, where even the central polka episode is tamed. So, on one hand, the performance is confident, the sound is beautiful, but on the other hand, I don't sense that excitement that can be found elsewhere. No surprises. The Second Concerto fares better under this approach. The second movement has the feeling of sitting in a big golden opera house, old and dusty, but the singers are good. The finale still radiates a lot of fun. Let's jump to disc 7, where Argerich reunites with Abbado, this time with the Mahler Chamber Orchestra, to do the Beethoven Third and Second. Abbado starts the Third on cat's paws, and we immediately feel that we are entering a different world: unknown as yet, a little scary, but exciting. Such storytelling reminds us of their Chopin and Liszt collaborations: contrasts, interplay of light and shade, friendly ball-throwing between the soloist and the orchestra. And how good it is to have a chamber orchestra here! Everything is in focus, sympathetically illuminated. The first movement is full of shimmering magic: it is not one of those boom-boom Thirds. The second movement is very relaxed - deep inhale, slow exhale, like a dreamy improvisation. The finale is bursting with youthful energy. The orchestra and the soloist try to outdo each other. And at the end you discover that this was a live recording - wow! The Second Concerto, with the same forces, was recorded at the same place four years earlier - live again. Lucky Ferrarans! The first movement emerges much more Beethovenian than Mozartean. It is really multi-dimensional, and again it is better with chamber forces. The orchestra is very stylish in the slow movement, and the piano part is heavenly, with every possible nuance. In the finale, again, Argerich is an elegant panther. Disc 6 contains three concertos from three epochs: classical Haydn, romantic Tchaikovsky and modern Shostakovich. Somehow, they combine well. And with such superb performances, this disc is a real treasure. The first movement of the Shostakovich clearly borrows from his experience of piano accompaniment for silent movies. And our movie has good actors: Argerich, the trumpeter Guy Touvron and the Württemberg Chamber Orchestra ruled by Jörg Faerber are well inside the idiom. The passions are exalted, as they should be in silent movies, the chases are spectacular, and the laughter is infectious. The melancholy of the second movement is heartfelt but not depressive - think Amelie Poulain having the blues. The hushed trumpet is magical, and the piano has enough weight in the grave culmination. The tears dry and a smile lights up in the tiny third movement, a transition to the over-the-top finale, where the pianist, the trumpeter and the strings play for their dear lives in a reckless galloping can-can! I cannot recall a presentation of Haydn's most popular concerto which I liked more than Argerich's. Granted, you feel that she comes from a more romantic tradition than Haydn probably had in mind. So, the authenticity is questionable. But the excellence is not. The opening movement is buoyant and energetic. It is full of innocent, childish playfulness. In places, the piano sounds like a modernized harpsichord. The slow movement is intimately emotional, with silver threads, and sadness shining through the smile. You may be surprised by the long cadenza. It is by Wanda Landowska and, indeed, it has some more modern moments. But doesn't it perfectly emphasize the beauty of Haydn's motifs? In my opinion, this is what cadenzas are for: paraphrase, elaborate, in order to bring the composer's music closer to your heart. The third movement has elastic springiness. The orchestra runs effortlessly alongside Argerich. A great performance, and very well recorded too. In the 1994 Tchaikovsky, with the Berlin Philharmonic and Abbado, the floodgates are opened in the first measure. The music starts like an avalanche, sweeping you along. This is the sort of drive to be found in best jazz. Not everybody loves Tchaikovsky First. You must really love it to perform it like this - and this feeling is conveyed to the listener. You'll discover new things in this familiar old chap - for example, did the orchestral accompaniment at around 12:40 ever sound so mandolin-like? The excitement is not yielded by sheer pressure: many places are delicate and chamber-like. The lyric moments are as lyric as Tchaikovsky can be. The second movement starts gently and becomes more playful. We see the sunshine, hear the merry horse-ride in the woods, silver bells and birds and happiness. Argerich's legendary precision is all there as usual. The performance of the finale is unique in its combination of wild abandon with a light touch. The ending is nothing short of orgasmic. The recording of the orchestra is not ideal - a bit buzzing at times - but this is not the kind of performance where you pay much heed to the recording issues. And it is live. Live! The only excuse not to get this collection is if you already have most of these recordings on your shelf.